What is the course all about? 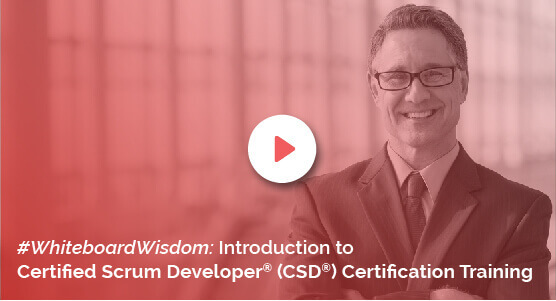 The certified scrum developer certification is a course that enhances a professional?s familiarity with the basics and practices of successful project management. The CSD certification in Canberra will enable any professional to plan/execute any industry projects efficiently and effectively to gain success. Benefits of the course After participation in a CSD course in Canberra offered by KnowledgeHut, a participant can expect his/her demand to go higher in the workforce or career as they can be an asset to any team in every organization for a lifetime. The seats for the CSD certification in Canberra workshop conducted by KnowledgeHut are always full as the participants enroll/register before announcement of classes to schedule it according to their convenient timing. The KnowledgeHut Way The CSD training in Canberra offered by KnowledgeHut covers both the basics, subject material via lectures, practice sessions/demos and real-life examples. Conducted by trainers/tutors of excellence in project management, the case studies (industry specific) learned via the CSD training in Canberra, if implemented, help an organization/professional gain value. Enabling teams to work in tandem, this course can ensure improvement in productivity of a specific department or the entire organization as a whole.